The Ex-Christian Scientist is an informal community of former Christian Scientists who strive to assist those questioning their commitment to Christian Science as well as those who have already left it. Some of us left Christian Science because it no longer made sense to us; some left because Christian Science caused us physical or emotional suffering. 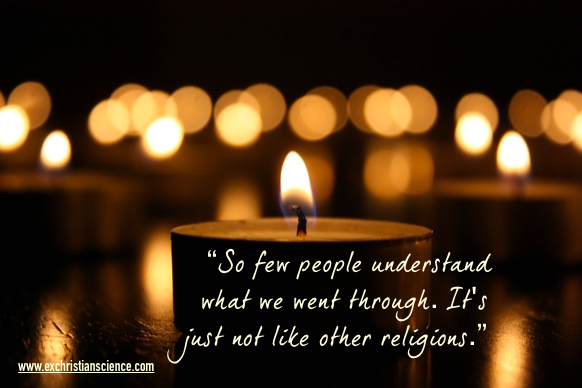 Some of us are still religious, some are not. What we have in common is a sincere desire to help those who are questioning Christian Science to decide if there is a better path for themselves–and to help those who have already left it to feel part of a larger community. We understand that contemplating leaving Christian Science can be fraught with anxiety and the fear of losing community. This site offers support resources to help individuals negotiate a transition in a manner that best fits their needs and convictions. We do not advocate any one particular path but acknowledge that there are many legitimate pathways that can be personally and spiritually fulfilling. The views and opinions expressed by our individual contributors do not necessarily reflect those of the The Ex-Christian Scientist. Who keeps the site running? Elizabeth was a fourth generation Christian Scientist and graduated from Principia Upper School. She created the memes and compiled and edited many of the memoirists’ writings for The Ex-Christian Scientist. When she is not staying up all night working on this project, she is a nanny and birth & postpartum doula. Jeremy is a former Christian Scientist and Principia College graduate. He writes and edits content for The Ex-Christian Scientist. He enjoys skiing, mountain biking, kayaking, and swearing at things that don’t work properly–like his truck or his computer. He marinated in the Krazy Sauce (as he calls it) of Christian Science for more years than he cares to admit, and now works to exorcise that demon from his tormented soul. Kat is a former Christian Scientist, Principia College graduate, and founder of The Ex-Christian Scientist. Depending on the day, she believes in the Celestial Teapot, the Sparkly Pink Unicorn, or the Flying Spaghetti Monster. If you would like to support The ExChristian Scientist, please consider doing your shopping via our Amazon Associates link. If you would like to make a large contribution, please consider making a donation to C.H.I.L.D.